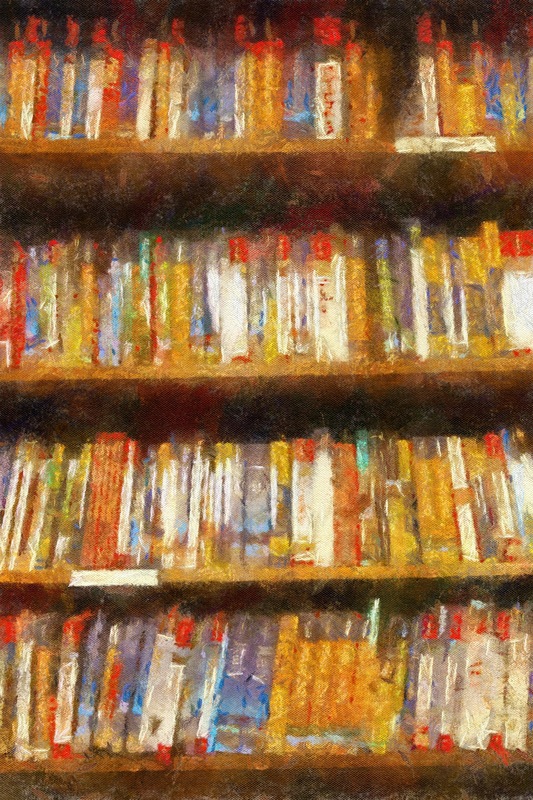 If Jordan had a calling card in the tourism industry, it would most likely be The Treasury. 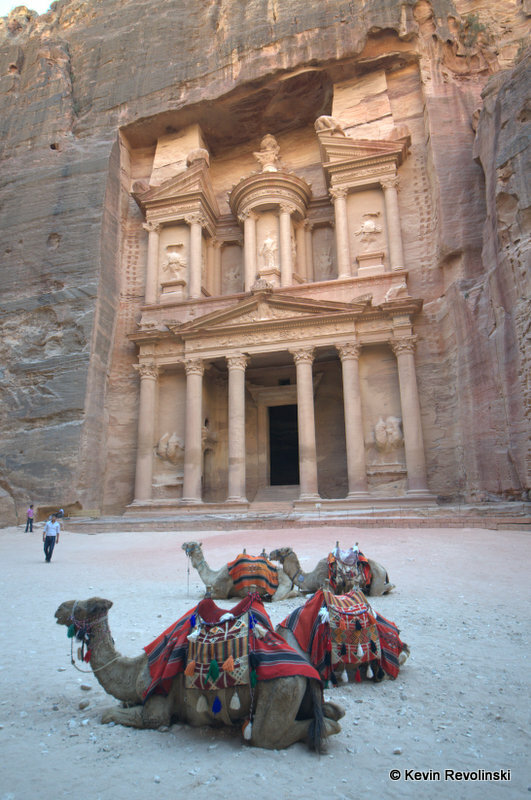 The rosy-colored, rock-cut star of the UNESCO World Heritage Site of Petra had a film career (Indiana Jones anyone?) that tickled the imaginations of moviegoers around the world and brought the archaeological park to worldwide recognition. The Treasury is, in fact, not a treasury, but likely a tomb–we don’t know for sure–built by the Nabataeans, but the real treasury of Jordan is much more diverse than a single–albeit impressive–site. 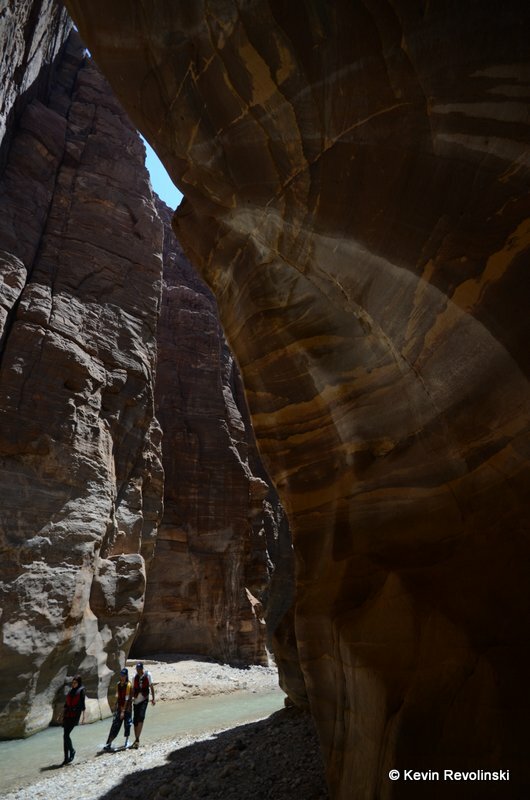 The sandstone of Petra, worn by flash floods long before it was carved by humans, is a hint of some of the natural beauty of the mountain and desert in southern Jordan. 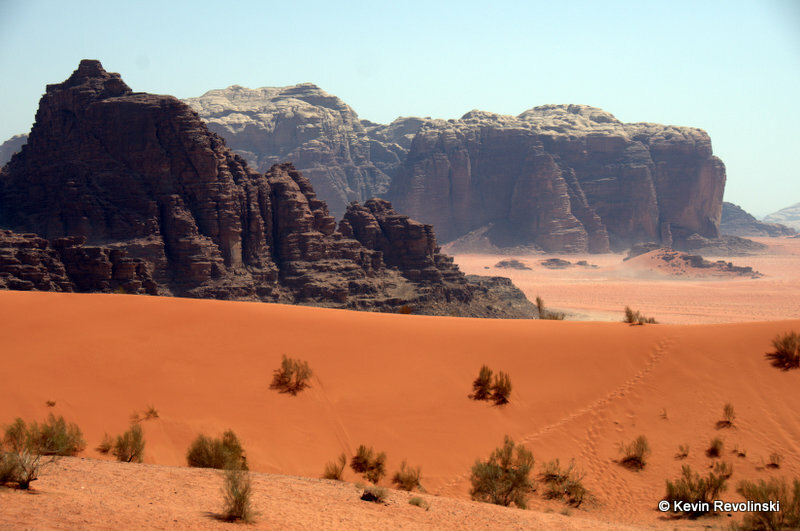 To get the full effect of the desert experience, head to Wadi Rum. The shifting sands, the otherworldly rock formations, the plant-life, unlikely and tenacious, can be explored by jeep or camel. The dunes rise like red waves and as you peer along the horizon, colors range from rusty orange to black-green taunting you to try to capture it in your camera as your eye perceives it. Whirling dervishes of dust cross the flats in the distance and the jeep stops at Bedouin tents for tea in the shade of goat hair canopies. If you choose to stay the night, the Bedouins have also created tent experiences. While these are not the actual homes, they are authentic structures with a few comfortable mattresses to lie on for the night. Meals are cooked in an ember-filled pit in the sand which is then covered with a lid and buried for a couple of hours. The chicken, lamb, and vegetables that emerge later are and tender and moist and served with hummus, olives, bread, and a bit of the sage-infused Bedouin tea. When the sun sinks beneath the mountains in the west dragging a wide wake of fiery red and orange, the stars, with no nearby city lights to compete with, blaze as bright and clear as you may ever see them. Jordan is believed to be the route Moses took when he lead the Israelites on their Exodus from Egypt. 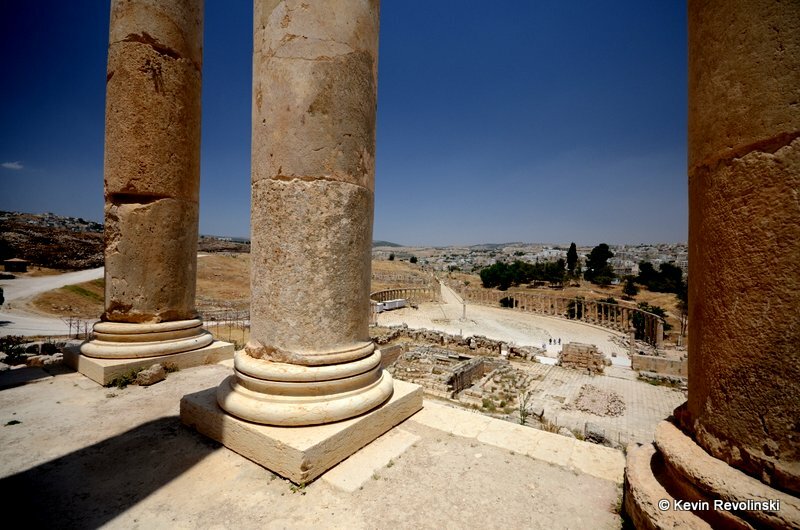 Travelers on Biblical heritage tours in Israel may also include Jordan in their itineraries. The story goes that Moses never made it to the Promised Land, and while there is no record of where exactly he lay down for his final rest, Mount Nebo is where he finally laid eyes on the destination across the Jordan River. A drive up to the top of this dusty mountain grants a view all the way to Jericho and even Jerusalem on a perfectly clear day. One of the more notable pilgrims to visit this site in recent times was Pope John Paul II who planted an olive tree for peace. Another important pilgrimage site is Bethany, the home of John the Baptist, just six miles north of the Dead Sea, an easy day trip from Amman. The Bible pegs this as where Joshua, Elijah, and Elisha crossed the Jordan River. It is also believed by many to be the site of the baptism of Jesus Christ. A float in the densely salty sea is simply a must. Jordan has several high-end resorts along their coastline of this sea shared with Israel. Many travelers come for the health benefits of the natural salts and the mineral-rich mud along the shore. As the Dead Sea is 1,388 feet below sea level, the sun has a bit more atmosphere to pass through plus a ubiquitous haze thus reducing the amount of UVB rays. While this doesn’t eliminate sun dangers altogether, it does make it possible to stay out in it for longer periods, making a spa trip here rather healthful for certain skin ailments such as psoriasis. The rocky coast shows bright white crystalline; stunning against the turquoise glow of the water along those bits of shoreline. Before you finish your time at the sea, prepare for a very unusual freshwater experience. While everyone has heard of the salty main attraction here, undiscovered country lies close at hand on a Dead Sea excursion. Mujib Nature Reserve is a narrow canyon where a cool river runs year round into the Dead Sea. You won’t need sunscreen or even a hat, and don’t bring a camera unless it’s waterproof; everything is going to get wet. The hike begins up a pebble-strewn riverbed with a view of colorful patterned sandstone smoothed by flowing waters; overhead birds soar high or flit back and forth from rocky roosts. The blue sky soon narrows until the canyon isn’t more than 30 feet across yet extends so high that the curves of the cliff walls make a thin ribbon of the blue above, in some places, nearly blocking it out altogether. The canyon echoes with the rush of water and there is no longer an edge to walk along; you’re up to your ankles…or your chest. Several small waterfalls must be climbed (with a few permanent metal handles in the rock or a knotted rope), and you arrive beneath a powerful cataract where you can swim and test your might against the plunging water before the return hike. This is a soft adventure experience that borders on moderate, but a natural beauty you are not likely to come across elsewhere. The fresh water is a relief after the salty sea and the heat of the desert sun. It’s not surprising that different species make different parts of the earth’s seas their home, but the vast differences in the subaquatic flora and fauna in this nearly pinched off inlet from the Indian Sea are notable. Many of them can’t be found anywhere else in the world. Jordan shares the Gulf of Aqaba with Egypt and Israel, but is the least traveled of the three. With more than 20 chronicled dive sites to choose from, five-star PADI operators such as SeaStar Watersports offer shore dives either right outside the shop or a short drive down the road. See an impressive wreck or a sunken tank, explore healthy reefs, and then be back at the shop for lunch without any lengthy boat trips back to shore. Based out of the city of Aqaba, just over the border from Eilat, Israel and reachable by ferry from the Sinai, you can enjoy diving or snorkeling in the Red Sea, and make trips into Wadi Rum nearby. Unless you are crossing into Jordan from Israel by land, Aqaba is a four-hour bus ride from Amman or a domestic flight of less than an hour. It’s unlikely that Jordan is the first place you’d think of if you’re looking for an excellent collection of Roman ruins, unless you’ve heard of Jerash. One of the finest surviving examples of a Roman city, Jerash lies just north of Amman. Evidence of settlement dates back to the Neolithic Age, but the city became part of the Roman Empire when Pompey conquered it in 63 BCE. Partly destroyed by a series of earthquakes in the mid-8th century, it died a slow death with passing wars and unrest. Crusaders described it as uninhabited. In the 19th century, with much of the ruins buried and forgotten in the sands, it was rediscovered by a German traveler, and didn’t start emerging in excavations until less than 100 years ago. Today the colonnaded main street, the theatres, some temples, the massive gate and much more spreads out like a life-size model of what a living Roman city might have looked like. It’s not hard to spend a full day investigating the far reaches of the place, where projects continue to reveal more about Jerash’s long history. And much like the many other attractions of Jordan, this one beckons you to enter yet another unexpected world.